Wowza! I do love a finish. 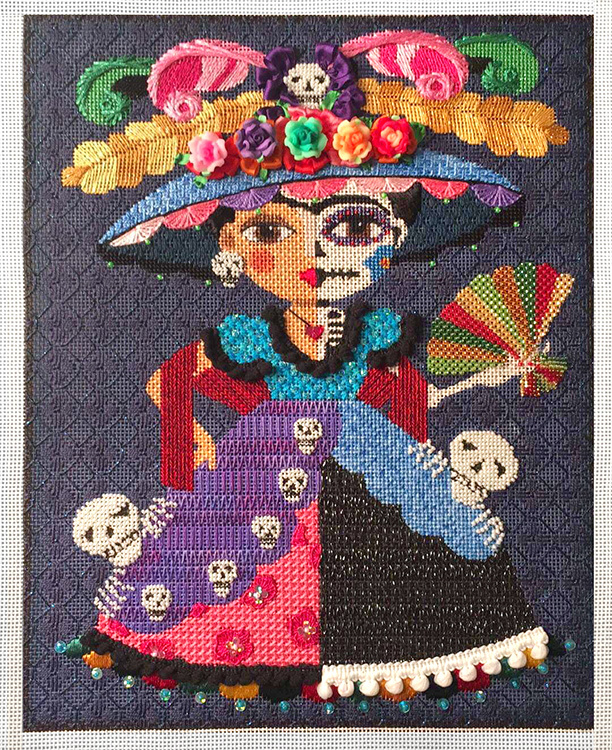 I wrote a stitchguide for Frida Dia de los Muertos by lulu mypinkturtle last fall and violá. Eleanor has her all stitched and ready for prime time viewing. She is a tour de force of happy fun colors and patterns. You won’t have time to get tired of any part of this canvas before it’s time to move onto another area. How fun is she? Thank you Eleanor, for sharing your finish. Canvases are in stock, just give us a bit to put together the threads and she can be salsa-ing her way to your house. Here’s the link, or give us a call at 410.296.0405. « Previous: Details and Texture Oh My! Wow! Beautiful work! Congrats on a great finish!